Music; Tan How Choon, with segments by Samsudin Majid. dancers in motion in the Snap the Dancers photography competition. The best pictures stand to win attractive prizes worth over $3000 in total and will be exhibited at The Arts House Gallery from 27 June to 5 July 2009. For application form, submission guidelines, and a list of prizes to be won go to the Arts House website. movement and sound exploration workshop for teens and adults puts the body in touch with its relationship. On the second night, the festival culminates with the All Can Dance Marathon featuring four hours of non-stop dancing onstage and off it in the last half-hour long finale party. Everyone is invited to perform their own choreographed dance of any style or genre (register beforehand) for the delight of dance enthusiasts and the picnicking public. 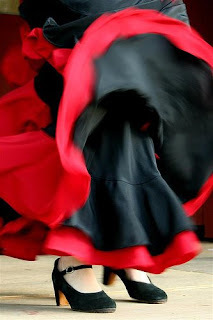 Our Flamenco group will be performing a small segment, with a beautiful balletic Bolero version of the Sevillanas dance as well as some castanet work. So for movement that really moves you, come trip the light fantastic with your family and friends - make a date with CampFire now! Ha, didn't know there is such a festival as Singapore River Festival. Will go down and have a look.